I'm honored and thrilled to have received a 2008/2009 Award from the Franklin Furnace Fund. This grant will support a new project that builds off of some of the things I've been working on over the past year. Thank you, Franklin Furnace! Once again, it's time for the MFA Open Studios at Hunter College when 150 artists open their doors. Please come visit me in Studio #416 (walk all the way through to the back). This year, I will be doing things a little differently. Friday Night Only (yes, that's TONIGHT! ), I would like to invite you to pre-view two Not-Yet performances in my studio beginning at 7:30 PM and at 9:00 PM. Each will go on more or less for about an hour. And why, you ask, do we need HELP!? http://huntermfabuilding.wordpress.com Seriously -- HELP! This October, I'm excited to be included in a selection of works from the German Camouflash exhibition to be shown in the Mediations Biennale in Poznan, Poland. Building Blocks and two video projects by DISORIENTALISM, Plugging Away and TV Maintenance will be among the American works in the Bienniale. This portion of the exhibition is organized by Marius Soltysik. Coming up in October, I'll be journeying west to visit my DISORIENTALISM collaborator Marianne Kim in Phoenix. While I'm there, I'll be a Guest Artist, visiting classes at Arizona State University. In conjunction with my visit to Arizona, DISORIENTALISM, my collaboration with Marianne Kim, will show a collection of our recent works in Phoenix at the Arizona State University Gallery. This November, I'm excited to return to share ideas with the incredibly inspiring collection of people at SLSA. I will at the Twenty-second Annual Conference in Charlotte, NC, presenting a hybrid telepresence performance / academic paper called "Live Chatter" in which I attempt to impersonate a chatterbot persona. While in Dresden to work on Building Blocks (see below), I'm staying at an alternative art space called 7.stock. Originally a squatted "seventh floor" of an office building in the center of Dresden, 7.stock has spread to 3 floors of the building and hosts an artist residency program. I will be giving an artist talk about my work on Sunday, August 24th. I'll be making a new performance and video project, Building Blocks, which will show as part of Camouflash, an International Artists Meeting organized by the curatorial group UNOACTU. Building Blocks will include a live public performance, taking place in the Prager Strasse beginning on Friday 29 August at 7:00 PM, one hour prior to the official opening. This project deals with the architectural history of the Centrum Warenhaus. A department store until its demolition in 2007, the Centrum Warenhaus was a classic example of International-Style socialist architecture from the DDR. In Building Blocks, geometric shapes modeled on the missing building's distinctive aluminum facade briefly reoccupy its former site. Dorsch Gallery in Miami will include a new video installation of mine in their upcoming group show, "Prescience," curated by Tyler Emerson-Dorsch. 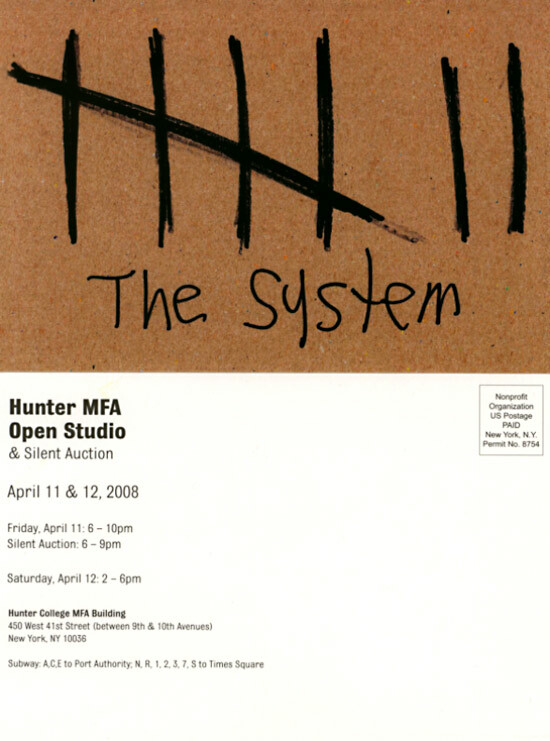 Spring Open Studios at Hunter are just around the corner. As per usual, you can find me in Studio # 416 (walk all the way to the back). I'll be showing some of the new work I presented last month in Chicago as well as a related new video work in progress. Performance curators Mark Jeffrey and Sara Schnadt have invited me to do a project for IN>TIME, a visual performance festival at the Chicago Cultural Center. The new performance and technology installation I'm developing is called "INimaging." Using Disney's movie Tron, Wilhelm Reich's discovery of "Bions," and Digital Imaging Software as points of departure, I'm envisioning Life inside Photoshop. Stay tuned for details!